The Administration Division provides planning, develops policies, organizes and directs the overall successful operation of the Police Department. The Deputy Chief supports the Chief with the daily police operations of the Department. He also assists the Chief in developing policies and procedures. The Administrative Services Manager supports the Chief with the business administrative functions of the Department. Oversees the function and maintenance of various units within the department while providing support for the community. Officers assigned to this unit are first line responders to calls for service and perform general patrol-related duties. If you need assistance from an officer or to report a crime, you can call 911 from within Kitsap County or dial (360) 308-5400, 24 hours a day. The Detective Unit is responsible for secondary follow-up investigations of crimes ranging from homicides, sexual assault, and robberies to burglaries, identity thefts, and frauds. 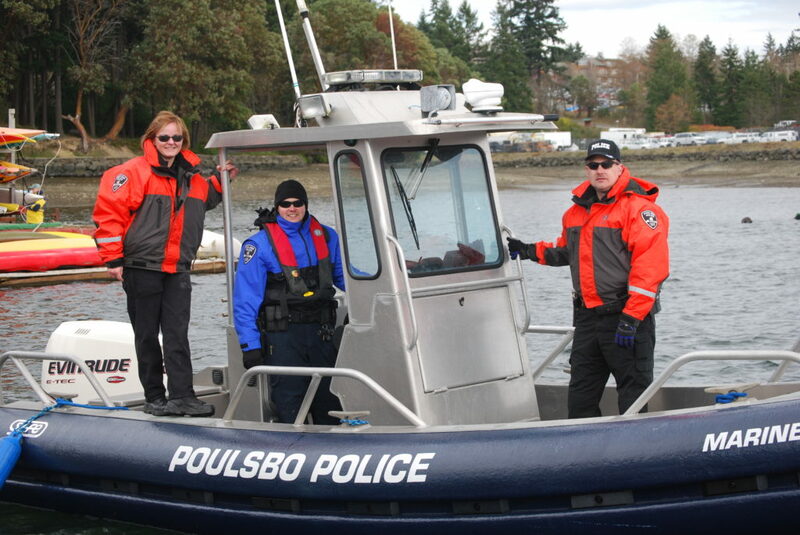 The Poulsbo Marine Patrol, presently, is comprised of two Sergeants, three Officers and the detective. The State of Washington Parks Department has certified all of the officers assigned to marine patrol after passing a State Certified Boating Academy. Our coverage area consists of Liberty Bay, with extra patrols in the Keyport Marina and Agate Pass. Marine unit duties include enforcement of boating ordinances, investigation of boating accidents, identifying and/or removal of navigational hazards, and addressing vessel operation complaints and concerns. Poulsbo Police Reserve Officers perform uniformed patrol duties in support of the Poulsbo Police Department. The primary mission of this voluntary position is to augment the full-time police force. After completing required training and graduating from a Reserve Academy program approved by the Washington State Criminal Justice Training Commission, Reserve Officers are fully commissioned Police Officers consistent with Washington State Laws. Started in 1996, the Poulsbo Police Department’s Citizen Volunteers Program is an organization of approximately ten citizens who are actively involved in serving their community, under the guidance and supervision of the Administrative Sergeant. Serving as extra “eyes and ears” for the police officers on duty, their presence has a proven, positive effect toward the deterrence of criminal activity. 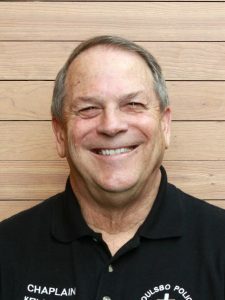 Articles and photographs have appeared in seven different regional and local newspapers, and several municipal and county law enforcement agencies have studied and started similar, successful citizen volunteer programs modeled from the Poulsbo Police Citizen Volunteers. To support Officers during and after critical incidents as needed. To assist when dealing with the public in such incidents as accidental deaths, suicides, suicidal subjects, serious accidents, drug and alcohol abuse, and other such situations that may arise. To provide an additional link between the community, other chaplain programs and the Department. To attend shift changes, do ‘ride alongs’, or just hang out with the department personnel. To perform crisis intervention and care for victims, families and witnesses of critical incidents. To assist with notifying families of serious injuries or death. To provide confidential counseling, spiritual guidance and insight for department personnel and their families if desired. Chaplain Ken Bailey has been the Department Chaplain since the inception of the Chaplain Program. Ordained in 2003, he is a part of The Charteris Foundation, and a member in good standing with the International Conference of Police Chaplains. Chaplain Bailey is a full time Chaplain also serving the Poulsbo Fire Department and the Kitsap County Sheriff’s Office. He also serves on the Kitsap County Department of Emergency Management’s “Critical Incident Stress Management” team. The support services unit provides a variety of services to the public, commissioned officers, prosecutors, and other law enforcement agencies. Their tasks consist of maintaining accurate records, dissemination of public records, and all business operations in support of the police department.